Pediatric Academy and Heart Association endorse soda taxes! The American Academy of Pediatrics (AAP)) and the American Heart Association (AHA) have issued a joint statement endorsing soda taxes along with other policies aimed at reducing risks for childhood obesity (the full statement is published in Pediatrics). Federal and state governments should support efforts to decrease sugary drink marketing to children and teens. Healthy drinks such as water and milk should be the default beverages on children’s menus and in vending machines, and federal nutrition assistance programs should ensure access to healthy food and beverages and discourage consumption of sugary drinks. Children, adolescents, and their families should have ready access to credible nutrition information, including on nutrition labels, restaurant menus, and advertisements. Hospitals should serve as a model and establish policies to limit or discourage purchase of sugary drinks. Comment: This action of the AAP is truly remarkable. In 2015, this Academy was heavily criticized for taking funding from Coca-Cola and, surely not coincidentally, saying little about the need for children to reduce consumption of sugary drinks. Once exposed, the AAP said it could no longer accept that funding. I did, however, hear an alternative story. Coca-Cola officials told me that as a result of their transparency initiative, the company would no longer fund the Pediatric, Dietetic, and Family Practice Academies. It is also hardly a coincidence that now that the AAP no longer takes money from Coke, it is free to promote soda taxes as a useful public health strategy. The BMJ (the new name for what was formerly the British Medical Journal) has just published a report by Susan Greenhalgh, an anthropologist and China specialist at Harvard, of how Coca-Cola, working through the International Life Sciences Institute (ILSI), got the Chinese government to focus its anti-obesity efforts on promoting physical activity rather than dietary changes. Professor Greenhalgh documented industry influence on Chinese health policy through review of published work as well as interviews with key players in this drama. A more thorough report of her investigation with details of her interviews was released at the same time by the Journal of Public Health Policy: “Soda industry influence on obesity science and policy in China.” This report comes with extensive supplemental information about her methods and interview details (these explain why training in anthropology is useful for this kind of work and provides information not otherwise available). For readers familiar with Coca-Cola’s funding of the Global Energy Balance Network (GEBN), this is a familiar story. I tell the GEBN story in a chapter in my recently released book, Unsavory Truth: How Food Companies Skew the Science of What We Eat. One surprise in writing that book was how often ILSI turns up in its pages. ILSI positions itself as an independent “nonprofit, worldwide organization whose mission is to provide science that improves human health and well-being and safeguards the environment,” but it was founded by Coca-Cola and is largely supported by food and beverage companies. It works in many countries to promote food-industry interests. Greenhalgh’s articles thoroughly expose how this organization accomplishes its objectives. 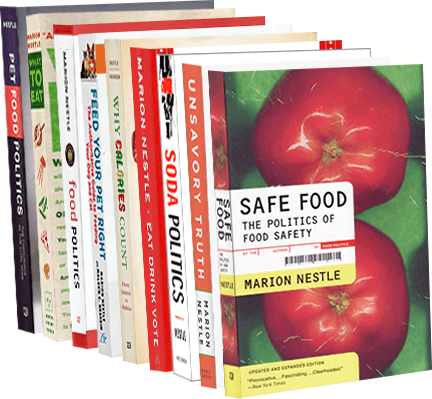 If you would like to know more about it, UCSF Food Industry Documents Library can help, as I learned about from this tweet. Greenhalgh’s investigation has received extensive press coverage. 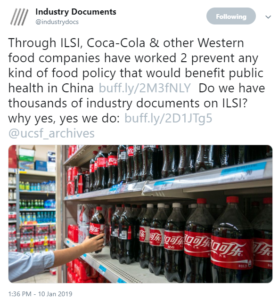 I was particularly interested in the account by Crossfit’s Derek Fields and Russ Greene, which provides further documentation of the close connections between Chinese health agencies, ILSI, and programs funded by Coca-Cola. Big Soda strong-arms California: no more soda taxes for 12 years. Shame! In 2017, Jennifer Pomeranz and Mark Pertschuck published an article in the American Journal of Public Health titled State Preemption: A Significant and Quiet Threat to Public Health in the United States. Last week, California Governor Jerry Brown signed a law banning new soda tax initiatives in the state until 2030, thereby preempting local initiatives planned and in progress. Raw, overt power politics (my emphasis throughout). The Sacramento Bee shows how it’s done. The Hill explains that this bill was a compromise. The measure was a last-minute compromise to stop an initiative circulated by the beverage industry that would make it more difficult to raise state and local taxes in California. “Mayors from countless cities have called to voice their alarm and to strongly support the compromise which this bill represents,” Brown wrote in a signing message. Big Soda’s tactic: use California’s ballot initiative process to put forth a measure requiring a two-thirds majority to pass any new tax legislation. Brown and those mayors must have assumed it would pass (anything to prevent new taxes). Brown said he would agree to a 12-year moratorium on new soda taxes if the soda industry would withdraw the measure. It did, and he signed. In other words, the beverage industry held the state hostage. Like the Sacramento Bee, I’d call this a shakedown. appears to be working as intended. As the deadline for signing the state budget approaches this week, a developing trailer bill attached to it would give Big Soda a 12-year ban on local soda taxes in exchange for dropping a ballot initiative that would threaten the finances of cities throughout California. Who says extortion doesn’t pay? Now the beverage industry has a new approach. Instead of fighting the ordinances city by city, it is turning to states, trying to pass laws preventing any local governments from taxing their products. The reactions have been fierce. The bill—a last-minute, backroom deal negotiated and written in secret by beverage industry lobbyists and their allies—is a significant step backwards in the ongoing effort to reduce overconsumption of sugary drinks. Let’s make sure that happens. And while we are at it, don’t let this happen in your state. If the soda industry threatens to mess with state elections, tell your representatives and governor to resist. California public health advocates: keep the pressure on. Advocate for bans on sodas everywhere you can: schools, hospitals, workplaces, government offices. Expose what the industry is doing to protect its profits at the expense of public health. Don’t give up. Courage! For the record, here’s where to find out more about this shameful episode. For the first time, Coca-Cola is adding alcohol to canned Coke (the rum, as in “Rum and Coca-Cola” was not premixed). It is launching the new alcohol-laced soft drink for the Japanese market. Most soft drinks in Japan, with or without alcohol, are local brands. Will alcohol help Coke increase market share? Can’t wait to find out. The soft drink industry is in big trouble. Sugary drinks aren’t great for health, and sales are down. But this industry keeps trying. I’m starting to collect interesting innovations. Would you believe?